Clarets midfielder Steven Defour has extended his stay at Turf Moor. The former Belgium international’s contract will now run to 2020 after the club took up the one-year option in their favour on his original deal, signed in 2016. Defour was a then-record signing from Anderlecht at around £7.5m. Defour’s representative Christian Pala said in February Defour would be prepared to talk about a new deal: “Steven is happy at Burnley, he had a good season until the injury, and if the club offers a new contract, and everyone can find an agreement, why not? 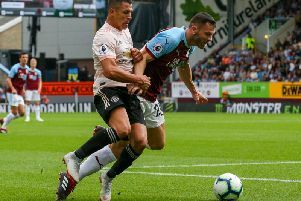 Defour has been out of action since the end of January after knee surgery, and further complications in pre-season, but he is close to a return, as Dyche added: “Steven is doing really well, he’s been fit for a week and training with us every day. ”He’s looking and feeling well, he’ll start a games programme next week, he’ll need a couple of games to build into it and build into a 90 minutes.